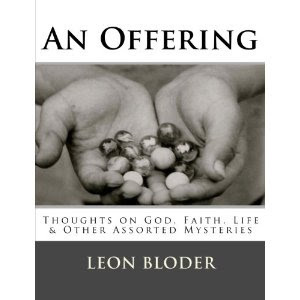 An Offering - Newly Released Book Now On Sale! Last year I attended Rob Bell's very first 2Day event in Laguna Beach, CA and it pretty much changed my life. I blogged about it here, and here, and here and here. There were others, but I don't want to bore you, or to give you the impression that the only thing I blog about is Rob Bell. I blog about other stuff. I promise. But in this case, I mention Rob Bell because he said something really profound that changed my life. He said that many of us didn't create art, write books, blog--whatever because we thought that it had already been done before. Then he said, "But not by you." I went home with those words stuck in my head, and I found the manuscript to "An Offering" and I started working on it again. Then I added more essays, and then I decided to do something crazy---publish it myself. Getting published is hard. It's hard because you get rejected---a lot. It's hard because it really is all about who you know, and being in the right place at the right time, or already being famous with a platform that a publisher thinks can be leveraged to generate sales. But if all you really want to do is get your art out into the world---then why not just do that? So I did. If you haven't already seen my posts on FB and Twitter, my book is now for sale on Amazon in print and for the Kindle. I am working on being able to offer it in other formats for Nook and iBook, but that may take me a bit. Here's the link for the print version which is $13 and qualifies for free shipping. Here's the link for the Kindle version which is $9.99 or you can borrow it for free for the next few weeks. Enjoy, and tell your friends! I'll have some print copies that I'll be signing and making available in the next couple of days for anyone who wants them.